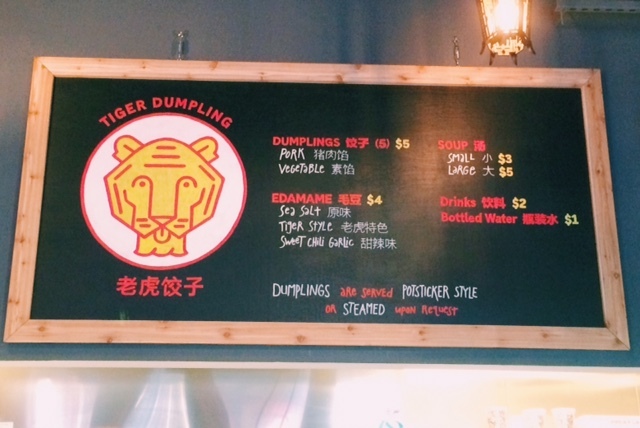 Tiger Dumpling Company – Go There. Try That. 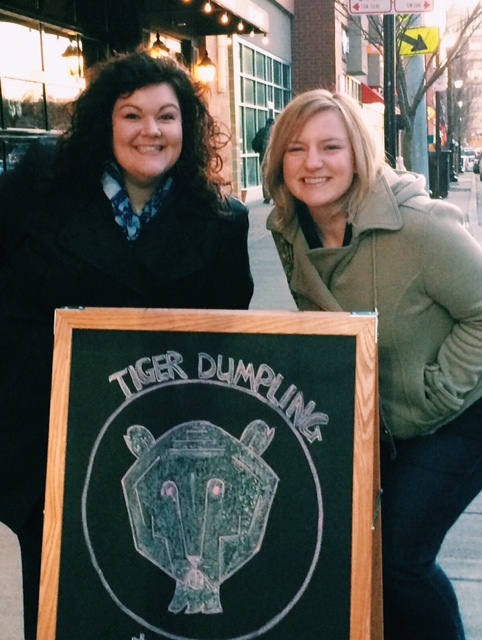 I went out with the girls recently to try Tiger Dumpling Company in Clifton. We found a parking garage just a couple doors down from the restaurant which is great because parking on Calhoun can be tricky and none of us can parallel park. We could hear the music from the restaurant before entering and the environment inside matched the rocking playlist. There’s a graffiti-esquie mural on the wall and funny signs about not drumming with your chopsticks! Trey at the register was incredibly friendly and hooked us up. Because we were there as a group, and didn’t mind sharing, he put our order together for us so we could try several things. The menu isn’t extensive; they serve several types of edamame, hot and sour soup, miso soup, and three flavors of dumplings. I actually find that kind of refreshing because I’m not overwhelmed and it makes me believe that if I want dumplings, I’m getting good ones because it’s the specialty. 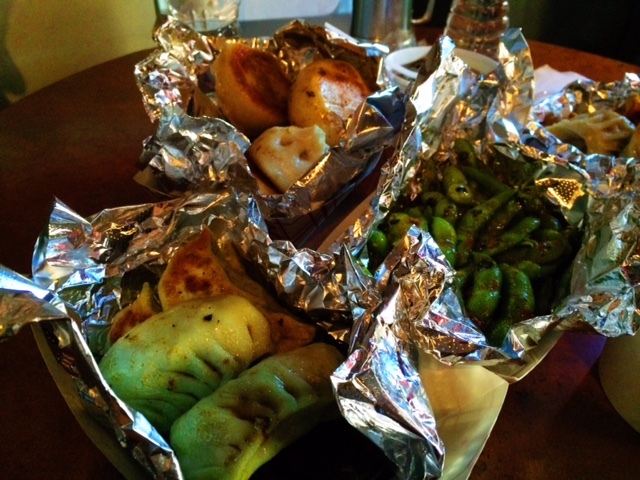 We ended up with sweet chili garlic edamame, hot and sour soup, pork dumplings, vegetable dumplings, and the special, chicken and chive baozi. We dug into the edamame right away and although it’s messy, it’s original and packed with flavor. Spicy with a sweet finish. 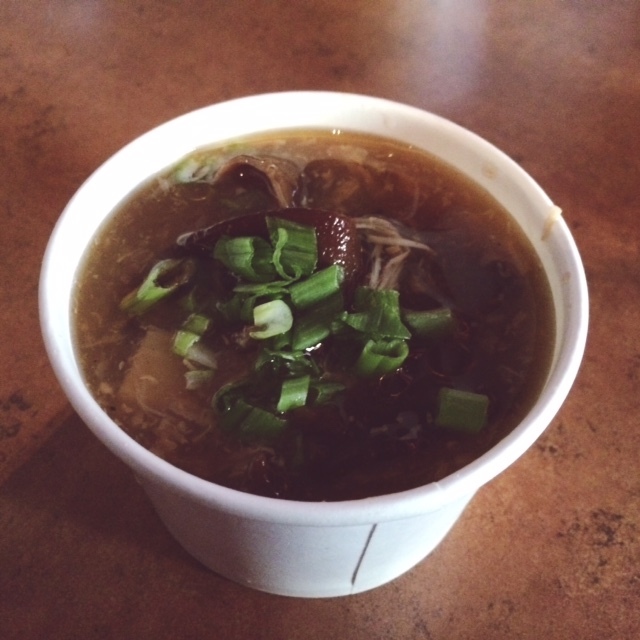 I am a huge fan of hot and sour soup and this version is a heartier, thicker soup. Kind of like with the edamame, I really liked that this was not the typical soup I’d get at every other Chinese restaurant. Overall, we liked each of the dumplings, but the favorite was the pork! Oh, so savory! The breading on the special dumpling was a bit thick for my taste; I think I just prefer the more traditional, but, we ate all of it! And while I consider myself a chopstick aficionado, these dumplings are just big enough that fingers are required. We also sampled several dipping sauces, and all landed on the Tiger Sauce. We were surprised that Tiger Dumpling Company is not a sit down, be served, enjoy your meal type of restaurant. Somehow we all had that idea beforehand. There are a few tall tables to sit at, but if those tables are filled, it could be difficult. I also found it strange that they don’t have a public restroom. That’s a first for me. In the end, for all three of us to share two cups of soup, a large portion of edamame, three types of dumplings, and drinks, it was only $10.00 per person. I don’t think that’s bad at all. Would I go back? Yes, definitely. The dumplings are warm, hearty, and filling. 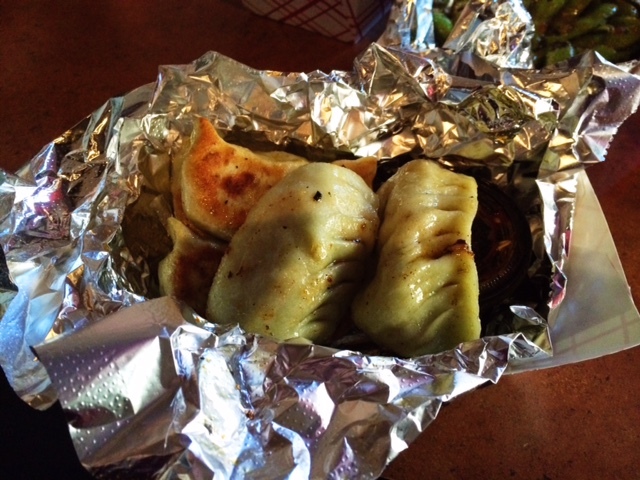 GO THERE (Tiger Dumpling Co.)! TRY THAT (pork dumplings)! Again, I wish I were able to give this place a try. You make it sound so good.